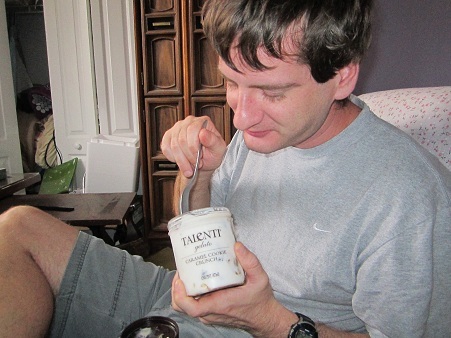 I have a new favorite thing - Talenti gelato e sorbetto! This gelato is literally, to die for. At my local store there was a large assortment of flavors, and I had the hardest time picking! Since I had 3 coupons I decided to pick one for myself, let Aaron pick one, and then let my grandma pick one. Instantly, I was drawn to the Belgian Milk Chocolate. I love chocolate (Who doesn't?!) and I was so close to picking it. After looking at nutrition labels, and wanting to stay true to my diet - I decided to go with the Roman Raspberry. I wasn't entirely sure of what I should expect for flavor. I mean, I obviously knew it would taste like raspberry - but the "Roman" kept me wondering. So, as soon as I got home I instantly opened it up - and I was very pleased! Even though the Roman Raspberry is lacking in caloric value - It sure as heck wasn't lacking in taste! It was very tangy, and had a tartness to it - But I loved that! I would absolutely buy the Roman Raspberry flavor again, without a doubt. Aaron of course, doesn't care about calories or fat content, so he picked one of the more rich flavors - The Caramel Cookie Crunch. The Caramel Cookie Crunch (according to Aaron) was "Really good" he liked the thickness of it, and he loved the little "surprises" of caramel and cookies. Oh, and yes. We love eating out of the containers! Not only does it ensure us that nobody will eat our gelato, but it also gives us less dishes to clean :p.
And then my grandma chose the Mediterranean Mint. My grandma loves anything with mint. She was a little skeptical about the "Mediterranean" part, because she wasn't sure what that was supposed to mean, but she really loved it. She said it was very rich, so even though the container of gelato seemed small, she's positive it will last quite some time. We love Talenti gelato e sorbetto! It is extremely delicious! Talenti is a little on the pricey side, but in my opinion it is definitely worth the extra. I plan to soon buy the Sicilian Pistachio, and the Sonoma Strawberry! If you haven't tried Talenti yet, I highly recommend it! 1 of you will receive 3 Free product coupons, so you can try a few different flavors for yourself! Disclosure: Review product was provided to me free of charge. All opinions expressed are my own, and were not influenced in any way. Facebook is in no way involved. This giveaway ends November 9th, 2011 at 11:59 pm. Winner is drawn via Random.org, and will have 48 hours to respond to my email, before a new winner is drawn. 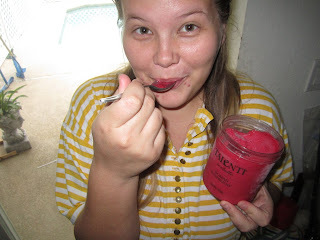 I'm not a big fan of ice cream but always enjoyed Sorbet so i think the fruit flavors of Sorbetto sound good..thanks!! I think the Caramel Cookie Crunch sounds really good. I want to try it because it sounds so good. I'd love to try the pistachio! I'd like to try it because I've read reviews that rave about it! I have not heard of this brand before so I would like to try it because we like sorbet at our house! I've never tried gelato before, so that's the main reason I'd like to try it! Plus the flavors sounds yummy! This looks like a really tasty and refreshing treat! I have not heard of it before this, so I would be interested to try it. I would love to try this because it sounds amazing and I always love to try new alternatives to just ice cream. Thanks! I have never tried this but I have seen it in stores + my daughter was in Italy and was crazy about their gelato. I'd like to try because it sounds delicious! Ahhh White Chocolate raspberry. Sounds wonderful. I'd like to try it because it's gelato I can get a the grocery store, rather than go to the gelato shop and stand in line for it. I love ice cream, this would be a great chance to try different kind. I would love to try this! I've never tried it before and it's always great to find a new treat. I would like to try Talenti to see if it is good as the gelato we had in Italy. I'm a huge gelato fan! I love sorbet, but I have not tried this brand before. Thanks for the chance! I would like to try Talenti because it looks very tasty!